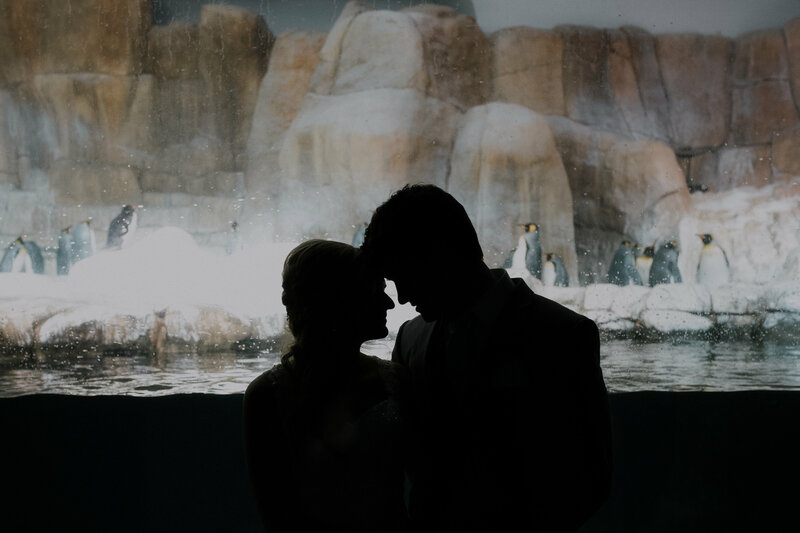 Everything is unique when using a rental facility at Omaha's Henry Doorly Zoo and Aquarium. It just isn't your typical function space. The Zoo comes with built in entertainment for your guests. Appetizers while gazing at penguins, or dinner and drinks with the white-handed gibbons in the Lied Jungle® makes for an exceptional atmosphere. Contact the Events Department at (402) 738-2088 or events@OmahaZoo.com for more information or to set up a site tour. Daytime venues are available from 8 a.m. – 5 p.m. daily. Some tables and chairs are included in the rental fees depending on the space selected. 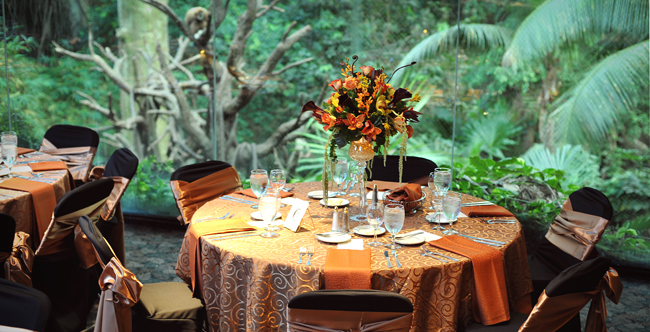 For daytime rentals and events, all food and beverage needs will be fulfilled by Omaha’s Henry Doorly Zoo and Aquarium®'s TreeTops Catering Department. Outside catering is not allowed for daytime events. Please call (402) 738-2088 for details. Zoo admission is included with all indoor daytime venues. The uniquely designed venue transports guests to a world under the sea with special features including a 24-foot acrylic tropical reef aquarium and 75-foot modular arts wave-like wall that can be illuminated by a variety of colored lights. The conference center has 5,302-square-feet of conference space and seating for up to 325 guests available. The Suzanne and Walter Scott Aquarium's Aquarium Conference Center can be divided into smaller spaces to best accommodate your group's size. Tables and chairs as well as Wi-Fi and audio visual equipment are included in the rental of this space. Three-hundred admission tickets included with rental. Let your imagination run wild! With a large private deck and fireplace, this building is perfect for corporate retreats. Located near the Lied Jungle, it can also be rented by small groups in the evening. Tables and chairs as well as Wi-Fi and some audio visual equipment are included in the rental fee. 60 admission tickets included with rental. Located inside the Desert Dome, this is the perfect space for a small social gathering or meeting. Tables and Chairs are included in the rental of this space. Thirty admission tickets included with rental. Located in the Mutual of Omaha’s Wild Kingdom Pavilion, this is the perfect place for a speaker, presentation or awards ceremony. Tables, Chairs and some audiovisual equipment are included in the rental of this space. 312 admission tickets included with rental. Newly opened in the spring of 2014 and located in the Garden of the Senses, the Garden Classroom is a quaint indoor space featuring murals of the African Grassland. This space is available daily in June and July, and available weekends only August through May. Tables and chairs, as well as some audio visual equipment are included in the rental fee. Forty admission tickets included with rental. Add a wild twist to your event with an up close and personal educational encounter with one of the Zoo’s Animal Ambassadors! Journey to Africa for your next gathering or celebration! Modeled after lodges found in the African savanna, the African Lodge features a high-pitched roof lined with plastic thatch shingles, uniquely themed lighting fixtures and a rounded dining space with an oversized faux stone fireplace. Indoor seating for 100, with additional outdoor seating, overlooks the four-acre elephant exhibit and wading pool. Spacious restrooms are also located in the area. To enhance the experience, guests are able to enjoy viewing the elephant family’s new quarters. Rental includes a tram. The African Lodge is only available April – October. Best dining venue in Omaha! With a 90-foot window overlooking the world’s largest indoor rainforest, this three-tiered restaurant has seating for up to 284 guests for a dinner or a cocktail reception. The Lied Jungle is open until 8 p.m. for guests to walk through. Tables, chairs and microphone are available. Dine among sharks, rays, penguins and other sea creatures. Seating is available for up to 60 guests in the shark tunnel and up to 100 throughout the Scott Aquarium. Larger groups can be accommodated. for a cocktail reception. Tables and chairs are available. This uniquely designed ballroom transports guests to a world under the sea! Seating is available for up to 325 guests and features a 24 foot acrylic tropical reef aquarium and 75 foot modular arts wave-like wall that can be illuminated by a variety of colored lights. Wi-Fi and audio visual equipment are included in the rental fee. Among wild and exotic creatures, treat up to 80 guests to a sit down dinner or 300 for a cocktail reception. This venue also includes an auditorium that seats 312. With a large private deck and fireplace, this space is perfect for an intimate retreat. Located near the Lied Jungle® this venue has enough space to accommodate 60 guests for a sit-down dinner and up to 85 for a cocktail reception. Tables and chairs as well as Wi-Fi and some audio visual equipment are included in the rental fee. Colorful gardens, bronze animal sculptures and exotic birds make this a charming venue for an event. Rental includes a tram from 6 - 9 p.m. The Garden is only available May 1 – September 30 and has limited patio seating available. It is ideal for groups of approximately 200 or less. The Garden Classroom, a quaint indoor space featuring murals of the African Grasslands and restrooms, offers space for 50 guests to gather. This building is included with the rental of the Garden of the Senses. The Lozier Theater lobby can accommodate up to 200 guests for a cocktail reception or 72 for a sit-down dinner. Rental fee includes an exclusive showing of a film, of your choice, from our film library. Add a wild twist to your event with an up-close and personal educational encounter with one of the Zoo’s Animal Ambassadors! Best dining venue in Omaha! With a 90-foot window overlooking the North America's largest indoor rainforest, this three-tiered restaurant has seating for up to 216 guests for a dinner, including space for a dance area, DJ, and cake table. Groups of up to 284 guests can be hosted for a cocktail reception. The Lied Jungle is open until 8 p.m. for guests to walk through. Tables, chairs and microphone are available. Dine among sharks, rays, penguins and other sea creatures. 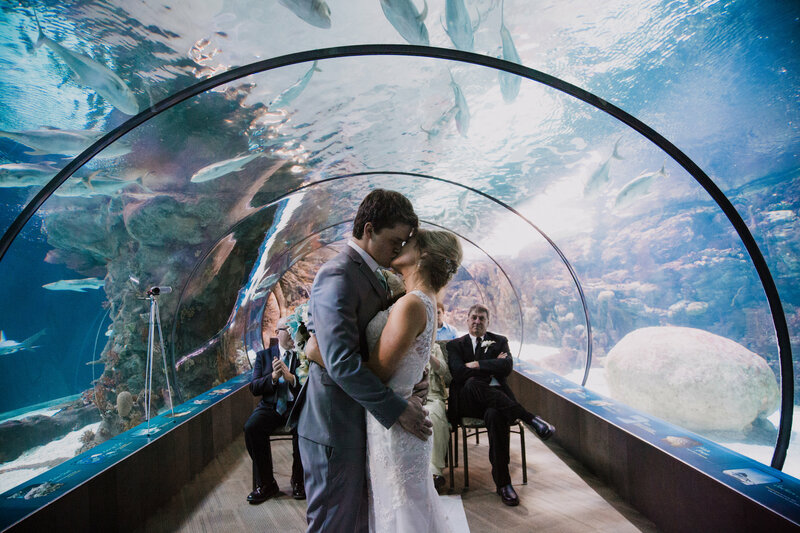 Seating is available for up to 90 guests in the shark tunnel or 200 for a cocktail reception. Tables and chairs are available. This uniquely designed ballroom transports guests to a world under the sea! Seating is available for up to 300 guests including space for a dance area, DJ and cake table. This space features a 24-foot acrylic tropical reef aquarium and 75-foot modular arts wave-like wall that can be illuminated by a variety of colored lights to match your wedding color scheme. Wi-Fi and audio visual equipment are available and included in the rental fee. Tables and chairs are available. With a large private outdoor deck and fireplace, this space is perfect for an intimate retreat. Located near the Lied Jungle® this venue has enough space to accommodate 60 guests for a sit-down dinner and up to 85 for a cocktail reception. Tables and chairs as well as Wi-Fi and some audio visual equipment are included in the rental fee. Colorful gardens, bronze animal sculptures and exotic birds make this a charming venue for an event. Rental includes a tram from 6 - 9 p.m. The Garden is only available May 1 – September 30 and has limited patio seating available. It is ideal for groups of approximately 200 or less. The Garden Classroom, a quaint indoor space featuring murals of the African Grasslands and restrooms, offers space for up to 50 guests to gather. This building is included with the rental of the Garden of the Senses. Contact the Events Department at (402) 738-2088 or events@OmahaZoo.com for your catering options. Birthdays - New Package Available! Available June 1 - Labor Day. Dip your hands in the shallow waters of Stingray Beach with cownose rays or experience the magical charm and nostalgia of Sue's Wildlife Carousel. When you're done with your excursion, venture over to Alaskan Adventure and play in the water with life-sized bronze sculptures of orcas, puffins, a humpback whale and more. *The Carousel Party Area is included in rental for cake cutting and gift opening. Available year-round. Guests will be sure to enjoy an up-close encounter with one of the Zoo's very own residents. We provide all of your basic party needs plus an animal visit! Cost is $300 for Omaha's Henry Doorly Zoo and Aquarium members and $325 for non-member. Cost covers 30 people. Each additional child or adult is $17.50. A minimum of 3 weeks notice is required. To book your party, please call (402) 738-2074. Birthday parties can be scheduled up to six months in advance. A non-refundable $50 deposit is due when the party is booked. The signed contract and remaining payment are due two weeks after making your reservation. The minimum base payment of $300 for members or $325 for non-members and contract are due no later than three weeks prior to the date of the party to keep your reservation. The MAXIMUM capacity for a birthday party is 60 (children and adults). Can I have a party for two children together? We do allow combined parties for two children. Please note that all of the same rules and features apply. What kind of animal will you bring or can I pick the animal? The health and wellbeing of the animals at our Zoo is extremely important. Therefore, the Animal Ambassadors that we use for these types of programs are on a schedule so that they do not become overused and stressed. Because of this, guests are not allowed to choose the animal and we can never guarantee that a specific animal will come to your party. My child is not four or older. Can we still have a birthday party at the Zoo? Yes, but please note the Birthday Program is geared toward children ages 4 and up. Can we rent the room for an extended length of time? Yes, the cost to add an additional 30 minutes to the rental is $50. What is the Zoo's cancellation policy? A written cancellation notice must be received by the Zoo at least three weeks prior to the date of the scheduled event. The remainder minus a $50 administration fee will be refunded. If notice is not received within this time, the entire fee will not be refunded. If you would like to reschedule, you must reschedule in one month to retain use of the rental fee. What if it rains or snows the day of my party? The Zoo rarely closes due to inclement weather. If the Zoo is open, the party will run as scheduled. There are no refunds or rescheduling due to inclement weather. All activities are held indoors. party is considered a guest. When is my final balance and contract due? A $50 non-refundable deposit is required upon booking. The signed contract and remaining payment are due two weeks after making your reservation. The minimum base payment of $300 for members and $325 for non-members and contract are due no later than three weeks prior to the date of the party to keep your reservation. If your party date is three weeks from the date of booking, full payment must be made to secure your reservation. When will I receive the admission tickets? What if I need more? Admission tickets will be mailed out once we receive the final payment for the party. The final payment is due within two weeks after selecting your date. If your guest count is over 30 people, each admission ticket is $17.50. When is my guest count due? If the total number of people at your party will exceed 30 (including the birthday child, any adults and children), please notify us no later than 1 week prior to your party. You are welcome to bring your own or we will order it for you. You have the option of either a 1/4 sheet or a 1/2 sheet. The flavors available are vanilla, marble or chocolate. The cake is decorated with an animal of your choice, drawn with frosting and says, "Happy Birthday [child's name]". What should I expect during the party? You may get into the birthday facility 10 minutes prior to your party. A birthday host will begin by giving each of the children a washable animal tattoo and a craft to work on. Party guests will then get to meet one of the Zoo’s very own residents. A zookeeper will share exciting information about an animal from our collection then follow up with questions and answers. Next, guests will participate in an animal-themed activity followed by cake, ice cream and the opening of presents. Can we store food or presents? The Zoo does not provide any storage areas. We suggest bringing or renting a wagon to help you cart items between the Zoo and your vehicle. Yes. However, we do not allow balloons, straws, confetti or pinatas for the safety of the animals. Also, we ask that any decorations be hung with removable tape only. No outside food may not be brought to the party. However, if you would like to have food add-ons provided during the party, you may place an order with the Events Department to be prepared by our TreeTops Catering Department. Please notify the Events Department. You are also welcome to take your guests to any of the concessions stands or the TreeTops Restaurant to eat before or after the party. If you have any other questions, please contact the Events Department at (402) 738-2074 or birthdays@OmahaZoo.com. There is a two-hour minimum for cocktail venues. Wander among thousands of majestic free flying butterflies in this total immersion exhibit. The pavilion can accommodate up to 100 guests for a cocktail reception. Located next to Durham TreeTops Restaurant and Lied Jungle®, this outdoor patio is perfect for cocktails before dinner. This space can accommodate 240 guests for a cocktail reception. Tables and chairs are included with this rental. An evening in the Desert Dome and Kingdoms of the Night combines three deserts under the world’s largest geodesic dome and the world’s largest nocturnal exhibit. Enjoy a sit-down dinner in the lobby for up to 50 guests or 300 for a cocktail reception. The Desert Dome animals will remain on display until 8 p.m. and the Kingdom’s of the Night lights will remain off until 9 p.m. Imagine an evening where gorillas roam free and you are on display! There’s plenty of room for everyone, with space for 300 guests for a cocktail reception. Enjoy cocktails where the best of college baseball was once played. Johnny Rosenblatt's Infield at the Zoo is a casual outdoor venue featuring a little league baseball-sized field, original Rosenblatt seats and the iconic Rosenblatt sign. Up to 300 guests can enjoy this space for your cocktail party. Get up close and personal with one of Omaha’s Henry Doorly Zoo and Aquarium’s giraffes. Inside, hay feeding nets, automated food dispensers and special enrichment items are installed along the enclosure's perimeter to allow for 24-hour stimulation and care. The Giraffe Herd Rooms can only be added on with another facility rental.